The current one is an era of profound and rapid changes, a Disruption Age° in which there is a leap – a breaking point° – compared to the orinary linear evolution of the Market; and the Business Models are radically transformed (and strategies, structures, etc.). To deal with this phase strategically effectively – in order to correctly interpret the new Demand° – it is necessary to completely redefine products and Company by adopting Disruptive innovation°. ● a “revolution” of the product development (and production/distribution methods). ● innovation becomes a fundamental factor: in this phase of rapid (and radical) changes it is no longer possible to try to maintain the position already achieved, but it is necessary to continuously improve the product prorpio and its own Company. Note that this is nothing but the way in which Civilizations develop: for a Civilization, there is no possibility of maintaining (long) a status quo. In the medium to long term the evolving Civilizations always prevail over the “consolidated” civilizations. ● innovation takes on a different meaning: it is essential to understand how, first of all, the concept of innovation is radically transformed: in development methods and goals. 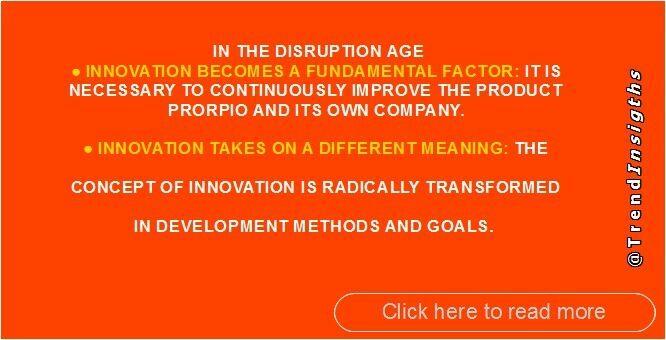 In the new form of innovation, the so-called disruptive innovation°, replaces the traditional R & D (aimed at improving some quality features of the product) with a process of substantial, radical transformation of its offer. – the new products are Smart: most of the value of the product is in its service-component (Product as a service), based on the intelligence embedded in it (software). This smartness is conceived in an evolutionary way (with software upgrades the qualities of the product can be transformed). – the products are highly modular, and therefore can easily be modified. ● Today, customers are no longer able to afford to buy the products of the current concept. These products are sold by leveraging emotional factors, such as the super-performance of the technologies and the status-symbol: factors that do not represent a real useful value for the Customer. That is, the Customers are forced, from a contingent situation, to buy only products that are able to satisfy their essential needs. – they realize that the new generation of technological products (together with the new good practices related to it) can improve – much – the quality of their life. and no more at emotional level. <see “Beyond the Automotive: radically new vehicles produced by new players” “Manufacturing 4.0: How will the new phase of Industry actually be”>. The product strategies that make a disruptive leap to the offer are fundamentally based on the actual correspondence of the product to the real needs of the people. The difficulty in correctly interpreting these needs and expectations is in the fact that this New Demand° presents absolutely new characteristics for the Market: new needs are hidden and in evolution. In order to develop new disruptive strategies, it is therefore necessary to radically change the mindset and structure of the company as well. It is therefore necessary to develop a New Vision°, and to use in the internal processes people that able to go beyond the current linear mindset°, that is the current lack of intuition°. But also radically change the size of work and production methods.